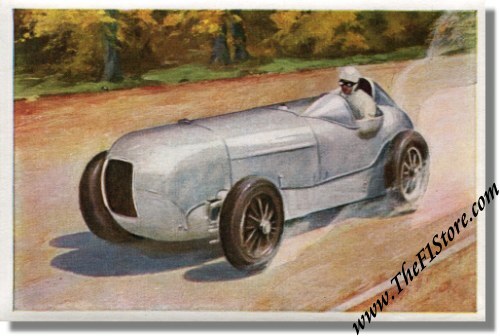 Vintage 1932 Collector's Card of Manfred von Brauchitsch (1905 - 2003), winning the 1932 Avus Rennen. On May 22, 1932 von Brauchitsch won in the privately entered Mercedes Benz SSKL Streamliner, setting a world speed record for the class with over 200 KM/H. 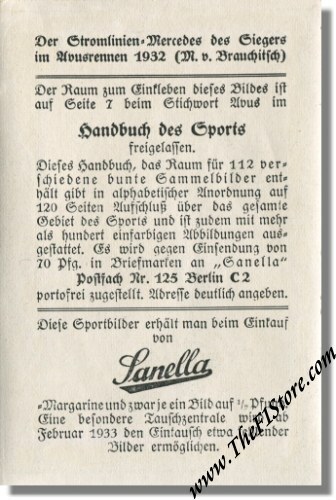 This pre-war card is in mint condition and measures 2.75 x 4 inches. 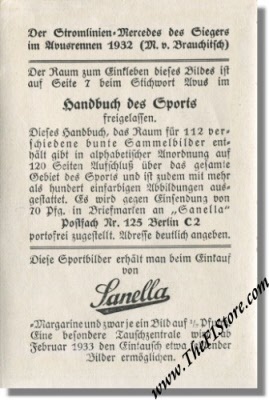 It was issued by German margarine manufacturer "Sanella" and was intended for their "Handbuch des Sports" or "Handbook of Sports".